In today’s Orange County Register online, I review last night’s Pacific Symphony concert in which the orchestra performed two new works by Michael Daugherty and other hits. Lame or inspired? It’s gonna appear in print? That’s good for the OC. Is it 5pm yet? I need my AM radio update on high culture. Yes, it’ll be in print. Radio spot will start around 5:40. I hope I can stay awake that long. Love the photo of AT, but it’s from the 1920s, before his NBC Symphony days, isn’t it? Glad you like the photo, Lisa. It’s actually a detail, for what it’s worth. 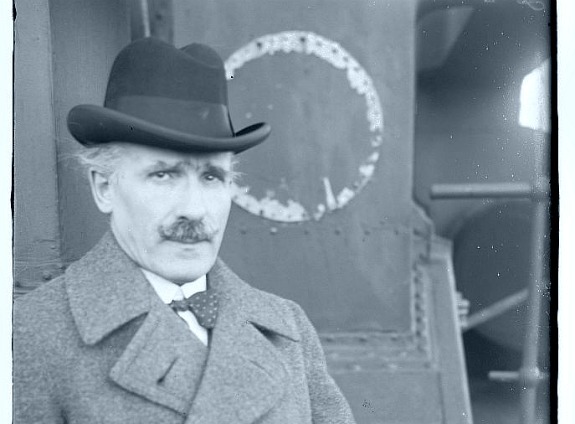 Toscanini is aboard a ship. Unfortunately, the photo is undated and the ship unnamed. How old would you say he looks? 60 maybe? That would be circa 1927, then. I just got back from the subject concert. My impression of the Daugherty piece “The Gospel According to Sister Aimee” was that it was a complete waste of time; cliches, redundant, boring, a real mess. However the second Daugherty piece was incredible; one of the most electrifying and moving pieces that I’ve heard in a long time. I couldn’t believe that it was by Daugherty. It was packed with interesting ideas, fantastic changes in rhythm, moving moments of nostalgia, and an energy that beautifully drove the entire process. I can’t wait for the CD. The Barber was pure heaven; one of those pieces that seems to comprise a universally recognized “American meditation on the frailty of life”. To wrap up, Gluzman was great in the Tchaikovsky. The audience exploded right after the first movement concluded and had to calm down a bit to take in the remaining two movements. Great concert from St. Clair and the Pacific Symphony, as usual. I listened to the debuted pieces by Daugherty on KUSC and I was pleased that Daugherty challenges to exceed interpretive freedoms in his music that will resonate for years to come. I do not believe anyone who critiques Daugherty possesses the sophisticated ear to warrant dominance of an opinion. Wow, really? I haven’t heard these particular works, but I have heard other music by Daugherty, and I will stand by my opinion of them: amiable, competent, unmemorable. Unless you are personally familiar with the people who’ve criticized Daugherty (a “critique” can be positive, you know), I suggest great caution in saying they lack the sophistication to do so. Also, I’m curious what you mean by “exceed interpretive freedoms.” That sounds like a description of a performer, rather than a composer or musical work. Can you say more? And would JK Jordan have made his remarks if I had given Daugherty’s pieces a positive critique? Would my ear have been, therefore, deemed sophisticated enough to pass judgement?